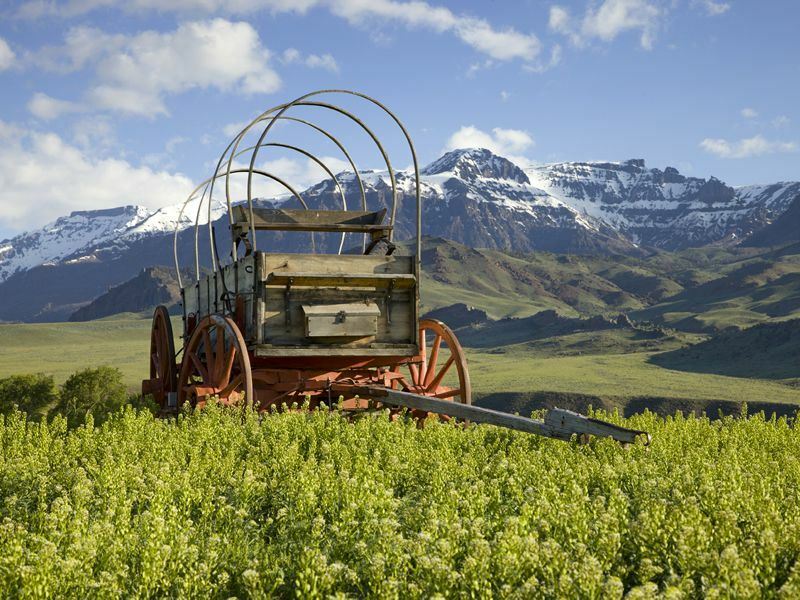 Legends are brought to life in the Great American West, a larger-than-life outdoors playground fuelled by awe-inspiring scenery, dramatic natural wonders, and nostalgic tales of gunslinging outlaws, roaming cowboys, gold-hunting prospectors, and myth-making pioneers. We visit the coolest photogenic locations in a wild frontier that’s every bit as exciting, expansive and epic in real life as it appears on the silver screen. The devil's in the detail at this nearly-vertical monolith that dominates the Black Hills landscape as it soars 1,267-feet above the tree-lined Belle Fourche River Valley and Wyoming's rolling prairies (it measures 867-feet-tall from summit to base and has a one-mile circumference). 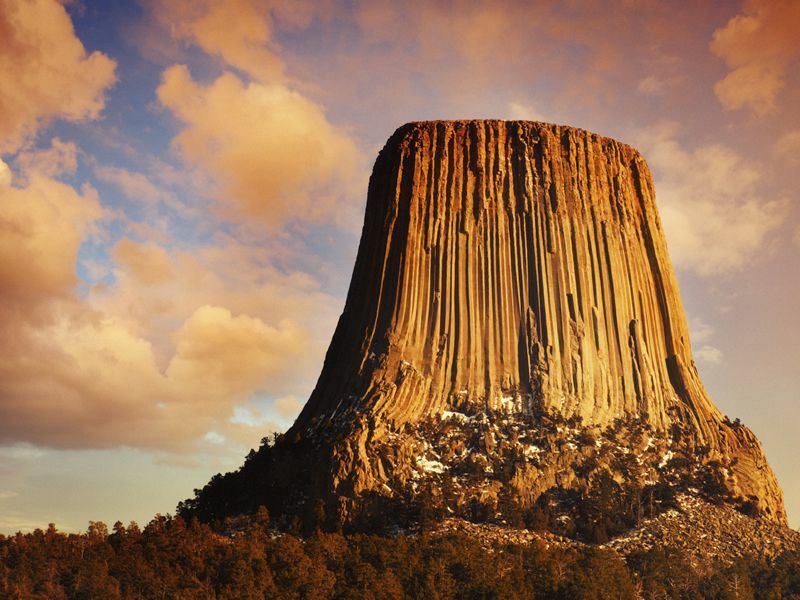 Not only was it the first ever official United States National Monument (proclaimed by President Theodore Roosevelt on 24 September 1906, the apostrophe in “devil’s” was dropped due to a typo and never corrected), but it was also an inspired choice as the otherworldly backdrop for Steven Spielberg's Close Encounters of the Third Kind in 1977. However, its real-life story is more impressive than even Hollywood could manage; not least for the ceremonial rituals, sun dances, prayers, and religious practices performed here by the Kiowa and Cheyenne tribes who live in the Black Hills region and deem this 50-million-year-old site as sacred. Get the shot: So long as you’re not planning to climb this rock formation in June (a voluntary closure has been secured for the entire month out of respect for nearby American Indian tribes), there’s hundreds of routes on the tower’s columned faces - many going all the way to the top. Alternatively, aim to photograph this mighty monument from ground level (obviously keeping the UFO and sci-fi enthusiasts who meet here regularly to discuss alien visitations out of shot). 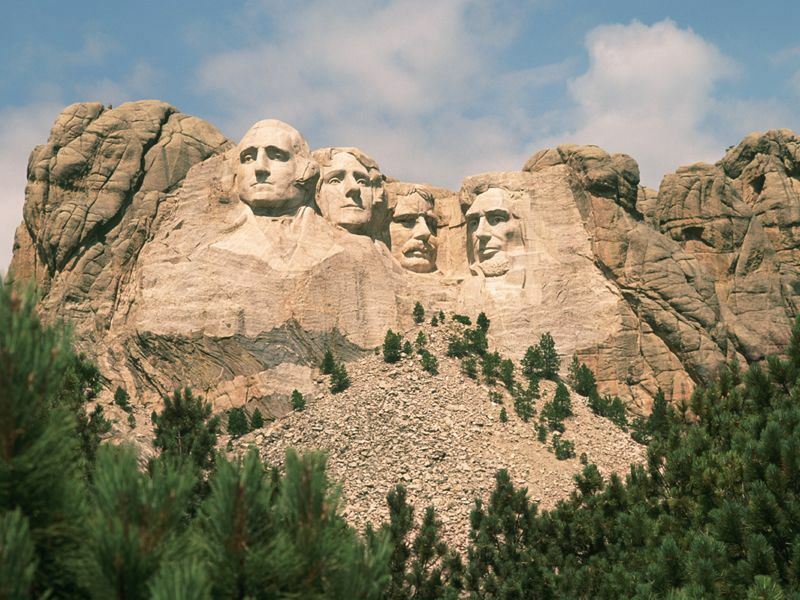 Nowhere is better for standing in the shadow of icons than the southeastern face of Mount Rushmore in South Dakota’s Black Hills National Forest. Named after the New York lawyer Charles E. Rushmore who travelled to the Black Hills in 1884 to inspect mining claims in the region, this eye-poppingly huge “Shrine of Democracy” features four gigantic carved sculptures depicting the faces of US Presidents George Washington, Thomas Jefferson, Abraham Lincoln, and Theodore Roosevelt. Overseen by Danish-American artist Gutzon Borglum between 1927 and 1941, this ambitious project saw some 400 workers work with 450,000 tons of rock in order to create the granite heads - each of which measures up to 60-feet-high and towers some 5,725-feet above sea level. The result of this man-made wonder is spectacular - and for many Americans the site stirs feelings of patriotism and reverence to a degree they did not expect. Get the shot: Get up-close with the founding fathers on the Presidential Trail - an easy half-mile loop that offers wonderful views for the photo-hungry (history buffs will enjoy learning about each president from the information plaques that line the way). Also check out the Sculptor’s Studio, the Lincoln Borglum Museum, and the superb Evening Sculpture Lighting Ceremony that takes place every Friday before Memorial Day and continues until 30th September. 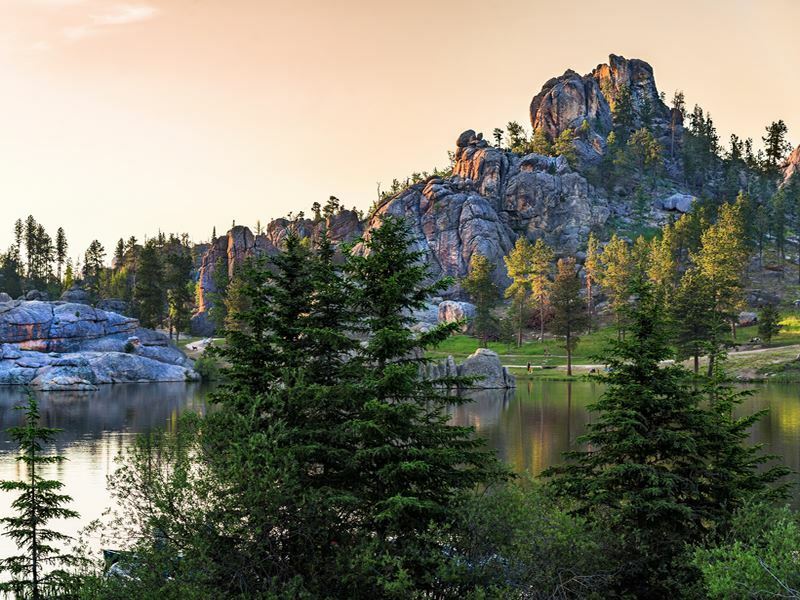 Of the five lakes in South Dakota’s 71,000-acre Custer State Park, Sylvan Lake gets all the love from photographers, artists, wedding planners, and moviemakers (it featured in Disney’s National Treasure 2: Book of Secrets starring Nicolas Cage). Created in 1881 when Theodore Reder built the Sylvan Lake Water Dam across Sunday Gulch Creek, this stunning spot rewards with a slew of amenities: a historic lodge with fine-dining, no-frills campsites, amazing hiking trails, a swimming beach, non-motorised boat rentals, and fishing (note that valid licenses are required). The lake is also a fabulous stop for those travelling on the iconic Needles Highway - a 14-mile road that takes you through pine and spruce forests, birch and aspen-filled meadows, and rugged granite mountains (this National Scenic byway was the vision of former South Dakota Governor Peter Norbeck who plotted the entire route on foot and by horseback). Get the shot: No visit to Lake Sylvan is complete without hitting at least one of the lovely hiking trails, especially Trail 9 from Sylvan Lake Trailhead that takes you to the top of Harney Peak, the highest mountain east of the Rockies (you’re assured incredible views of the Black Hills as well a glimpse of Mount Rushmore). Also be sure to make your way to Needle’s Eye - the crazy-looking rock formation that stands at 40-feet tall and features an unusual slit that's only a few feet across. Named in honour of the nation’s 26th president, this 70,000-acre wilderness fuelled by dense cottonwood forests, dome-shaped hills, wind-swept prairie grasses, and vivid painted canyons is unique in that the landscape is unusually lush for badlands (the dry terrain that’s the trademark of America’s West). 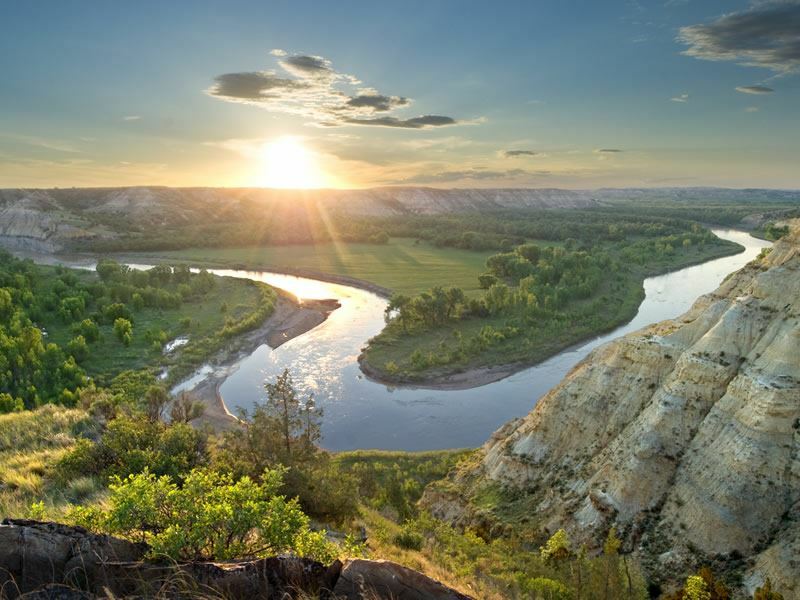 Linked by the Little Missouri River (an essential water source to the abundance of wildlife), the park is divided into two sections: South Unit along Interstate 94 near Medora and the less-visited North Unit on Highway 85, about 14 miles south of Watford City. Both are perfect for adventure-seekers who fancy either floating down the river on a kayak or canoe or traipsing through the woods to photograph white-tailed deer, feral horses, and great-horned owls. Alternatively, secure a backcountry camping permit at the visitor centre and pitch up your tent anywhere in the park (so long as it’s within a quarter mile of the road). Get the shot: Although Roosevelt’s cabin is gone, it’s still worth venturing to the 218-acre Elkhorn Ranch to see the foundation stones and the water well (the site is located between the North and South Units and accessed by gravel roads). Equally visit-worthy for history buffs and budding conservationists is the Maltese Cross Cabin, the restored ponderosa pine log cottage built between 1883 and 1884 after Roosevelt arrived in Dakota Territory for a hunting trip. Nicknamed the Niagara of the West by early settlers, Shoshone Falls is the thundering Snake River waterfall measuring 212-feet-high (45-feet higher than Niagara Falls) and nearly 1,000-feet wide. Located in southern Idaho, about three miles northeast of Twin Falls, it offers a unique blend of outdoorsy activities; from children’s playgrounds and stellar picnic spots to swimming areas, cycling paths, and a safe viewing platform for photographers. 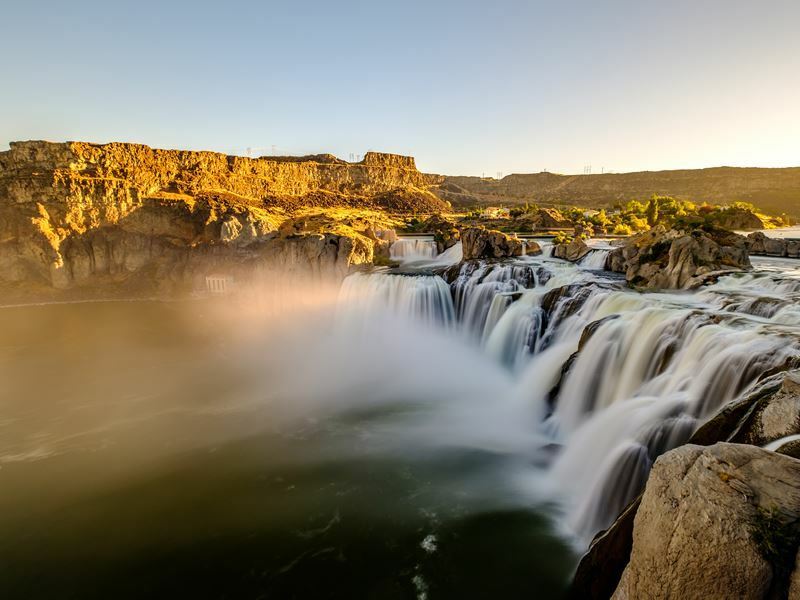 Once you’ve marvelled at the powerful water flow which can propel a whopping 20,000 cubic-feet-per-second at its spring peak, get your hiking boots on and hit the Canyon Rim Trail (accessed directly both from Shoshone Falls Park and Dierkes Lake). The area also has plenty to impress adrenalin-junkies, including rock climbing, stand-up paddle boarding, and BASE (Bridge, Antenna, Span, Earth) jumping off the 486-feet-tall Perrine Bridge in nearby Twin Falls. Get the shot: Shoshone Falls is at its most dramatic from April to July, as the diversion of the Snake River often significantly diminishes water levels in other months. Be sure to drive into Shoshone Falls Park for great views - or see the falls by way of paddleboard, canoes, or kayak during the summer when the current is almost non-existent (this six-hour round trip requires a lot of paddle power, but rewards with a unique vantage point of the falls at river level). There’s plenty worth getting your camera for at this 310,000-acre park located south of Yellowstone National Park and north of Jackson. 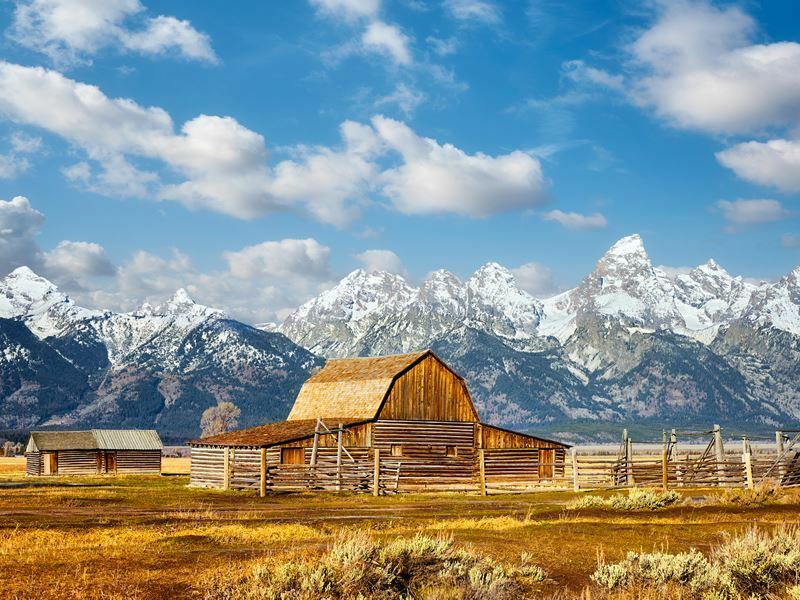 Not only will you be awed by the varying habitats (mountains, glaciers, valleys, lakes, rivers, meadows, low-lying plains, and of course the 70,000-feet-high Teton peaks), but the park is also filled with old homesteads and cattle ranches - all of which are a joy to photograph. Equally worthy of your attention is spending time at Jenny Lake (either hike the six-mile lake loop or hop on the ferry to save time), taking the 2.2-mile round trip to Inspiration Point, and stopping for pictures on the junction just before Jackson Lake Dam. There’s also plenty of wildlife to grab your interest; expect sightings of yellow-bellied marmot, black and grizzly bears, big horn sheep, golden eagles, bison, coyotes, and moose (during the winter, the National Elk Refuge just south of the park is home to 7,300 migrating elk). 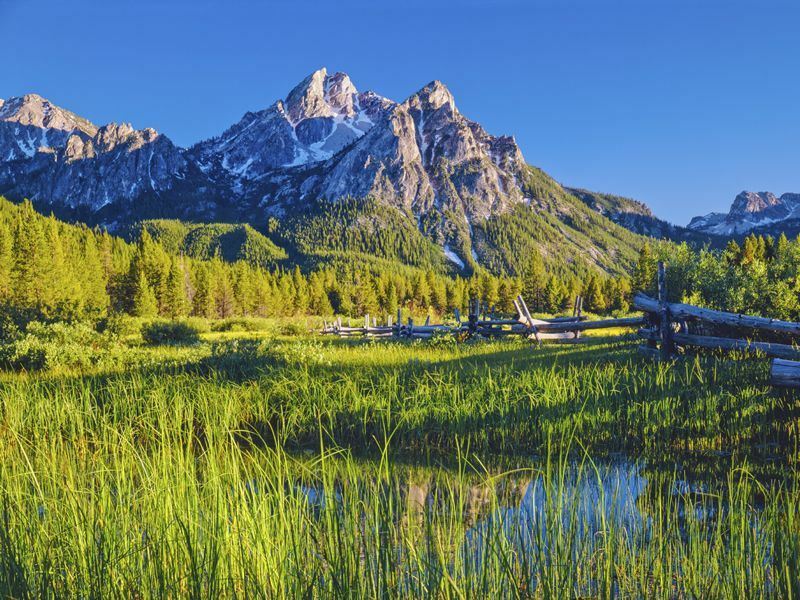 Get the shot: Easily the park’s most-photographed spot, the horseshoe-shaped Oxbow Bend is located on the connector between Jackson Lake Junction and Moran Junction. Once you’ve nailed the iconic shot of the Snake River with Mount Moran’s reflection, keep your eyes firmly peeled for moose wading in the wetlands as well as hundreds of bird species such as Canada geese, bald eagles, ospreys, blue herons, white pelicans, and trumpeter swans. 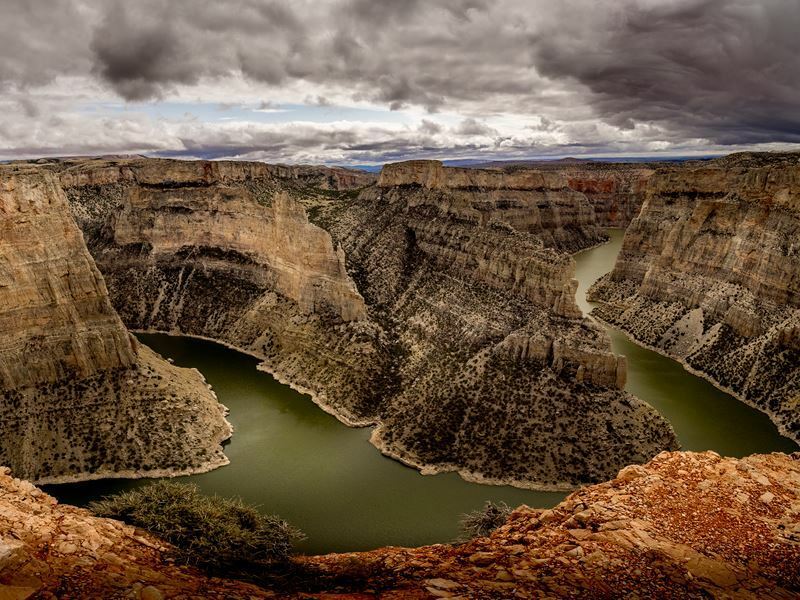 Located at the heart of the Bighorn Canyon National Recreation Area, the third-largest canyon in the country serves up a landscape of forest, mountains, upland prairie, broad valleys, high desert, wetlands, and massive limestone cliffs measuring over 1,000-feet-high. With around 120,000-acres of wilderness that straddles the northern Wyoming and southern Montana borders, the visual thrills here are tremendous; especially around the 71-mile-long crystalline lake that extends the entire length of this geological wonder. Must-dos include hitting any of the 17 marked hiking trails, taking a Bighorn Lake scenic boat tour, cycling in the South or North District, fishing for trout, bullhead, or walleyes, and renting kayaks, canoes, or scuba diving equipment. There’s also unrivalled wildlife-watching; expect bighorn sheep, Pryor Mountain wild horses, coyotes, mule deer, snakes, mountain lions, bears, and more than 200 bird species. Get the shot: Sunsets and sunrises are the best times to explore Bighorn Lake’s glass-smooth surface as the sun paints the canyon walls with a breathtaking palette. Also head to one of the area’s ranches (Mason-Lovell Ranch, Ewing-Snell Ranch, Cedarvale Dude Ranch, and Caroline Lockhart Ranch) to learn more about the area’s Old West history and head to the Visitor’s Centre in the town of Lovell (at the junction of Highways 14A and 310) to see some interesting exhibits. Synonymous with Ernest Hemingway who had a special connection with this exceptionally scenic and rugged wilderness, the peaceful Sawtooth Mountains are a range of the Rocky Mountains located in central Idaho (the author’s Ketchum home overlooked what he described as “the loveliest mountains that I know"). Reaching a maximum elevation of 10,751-feet at the summit of Thompson Peak, they encompass an area of 678-square-miles and feature some 57 peaks, 700 miles of trails, over 300 mountain lakes, and plenty of season-specific pursuits such as backcountry camping, hiking, fishing, kayaking, canoeing, rafting, cycling (summer) and cross country skiing, snowshoeing, and snowmobiling (winter). Further highlights include keeping your eyes peeled for elk, bighorn sheep, and mountain goats, visiting the ski towns of Ketchum and Sun Valley, and exploring the canyons, valleys, nearby ghost towns, and abandoned mines. 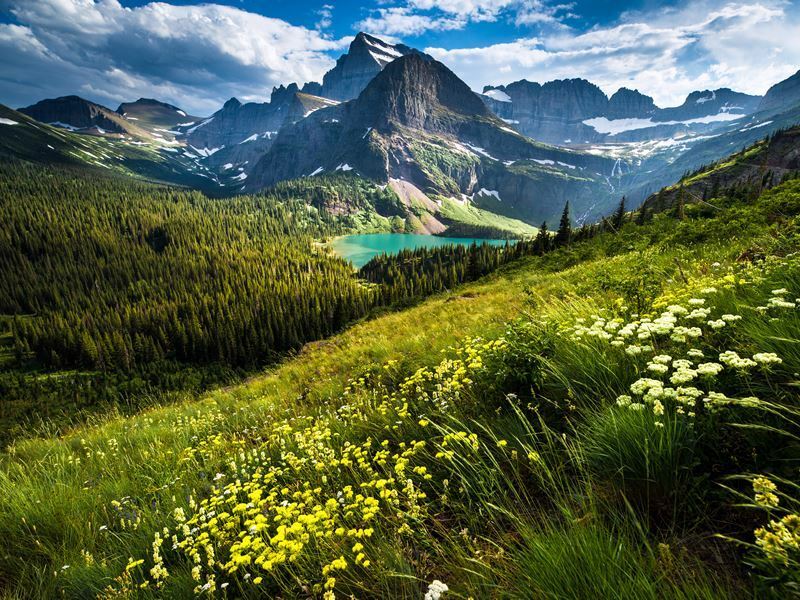 Get the shot: Once you’re done marvelling at the jagged peaks, razorback ridges and crystal-clear alpine lakes, head to the Park Creek Overlook for powerful images of the mountain’s northern edge rising over a wetland meadow. You’ll also be a short driving distance from Stanley - the off-the-beaten-track town at the foot of the Sawtooh Mountains and on the banks of the Salmon River (it is often hailed as one of the last strongholds of the Idaho frontier). There’s no shortage of photo ops at this turquoise-tinted stunner in Glacier National Park, the Montana jewel that straddles the USA-Canada border. Named for American conservationist and author George Bird Grinnell who spent two decades working to establish the area as a national park, the lake is accessed in two ways: by hiking the seven-mile Grinnell Glacier Trailhead near the Many Glacier Hotel or by boat shuttle on Swiftcurrent Lake and Lake Josephine. Equally memorable is travelling on Going-to-the-Sun Road - the two-lane mountain road that’s the only one to traverse the park (it crosses the Continental Divide through Logan Pass at an elevation of 6,646-feet). Ranked as one of the best scenic drives in America (and the first to be registered as a National Historic Place, National Historic Landmark, and Historic Civil Engineering Landmark), it runs for 50 miles and spans the width of park between the east and west entrances. Get the shot: Given that the water here is seriously cold, few people attempt an end-of-trail swim. Once you’ve admired the greenish-blue colour of the water (the result of rock flour and glacier silt), seek out the pristine forests, plunging waterfalls, and 25 active glaciers that remain in Glacier National Park. You’ll also find one of North America's largest grizzly bear populations here, along with 270 species of birds and nearly 70 species of mammal. As the world’s very first national park, this two-million acre playground stretching through Montana, Idaho, and Wyoming wows with dramatic peaks, red-tinged canyon walls, hydrothermal wonders (hot springs, mud pots, fumaroles, geysers), vast forest, and awe-inspiring natural wonders like Old Faithful and Mammoth Hot Springs. There’s also off-the-scale attractions for snap-happy adventurers; think hiking trails for striking views of waterfalls and cascades, alpine lakes for fishing, backcountry for horseriding, and remarkable landscapes for wildlife-watching (there’s even a grizzly and wolf discovery centre for those into conservation tactics). 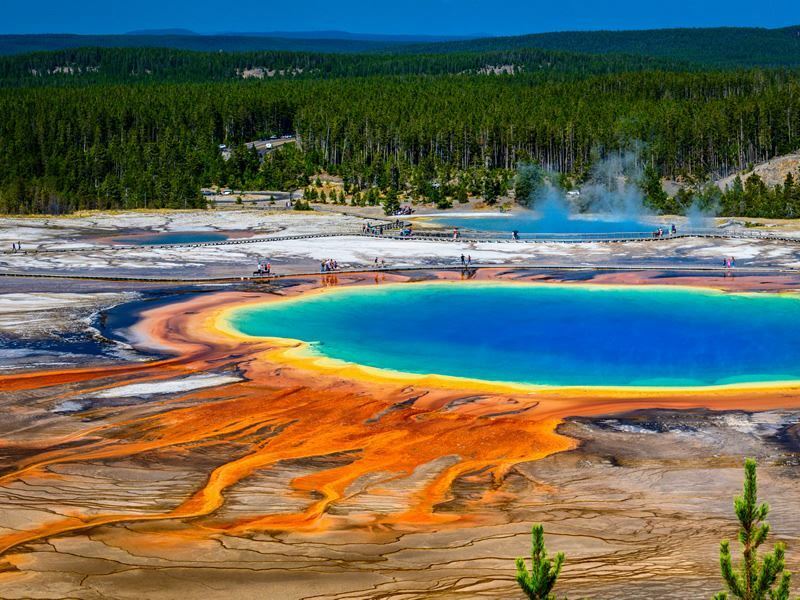 You’ll need a minimum of three days to see everything here, so be sure that the psychedelic-looking Grand Prismatic Spring, the 136-mile-wide Yellowstone Lake, and the Grand Canyon of the Yellowstone with its three waterfalls (Upper Falls, Crystal Falls, and Lower Falls) is on your to-do list. Get the shot: Located in the park’s northeastern corner, Lamar Valley is known as America’s Serengeti for good reason. Accessed from the Grand Loop Road east past Tower-Roosevelt, these wide and open meadows in are unbeatable for potential sightings of elk, bison, osprey, antelope, bald eagles, moose, bears (blacks and grizzlies), and wolves. Aim to get here either the early morning or late evening to maximise your viewing chances.